Thank you, Vital Proteins for sponsoring this post! All opinions are my own. 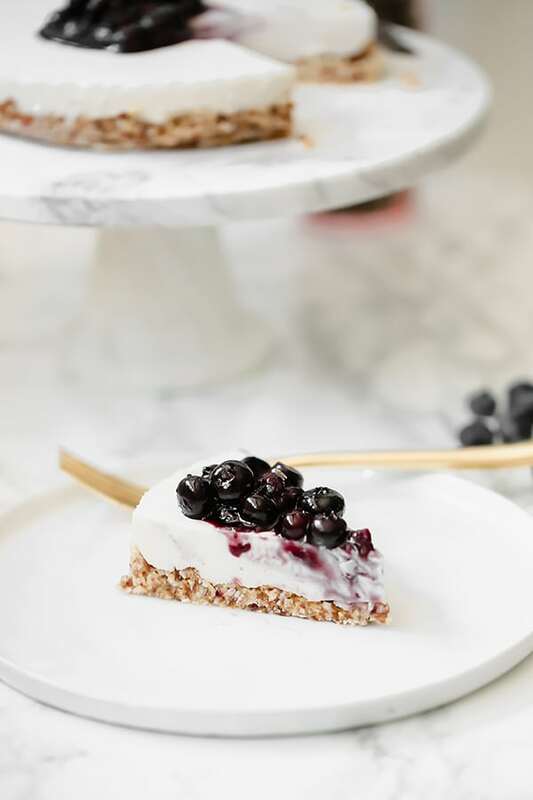 This blueberry lavender cheesecake is incredibly simple to make, and is completely dairy free! It’s Paleo, AIP, and features gut-healing gelatin. Mother’s day is almost here, and mom seriously deserves something special that everyone can enjoy, right? Gifting mom a fun, delicious treat that actually requires zero baking sounds like a major Mother’s Day win to me. 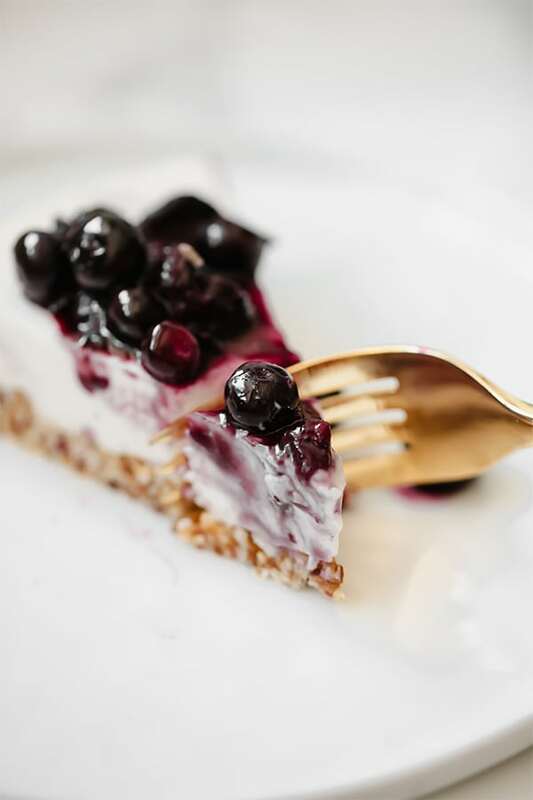 Cheesecake is one of those decadent desserts that everyone loves and making it allergen friendly only makes it better! 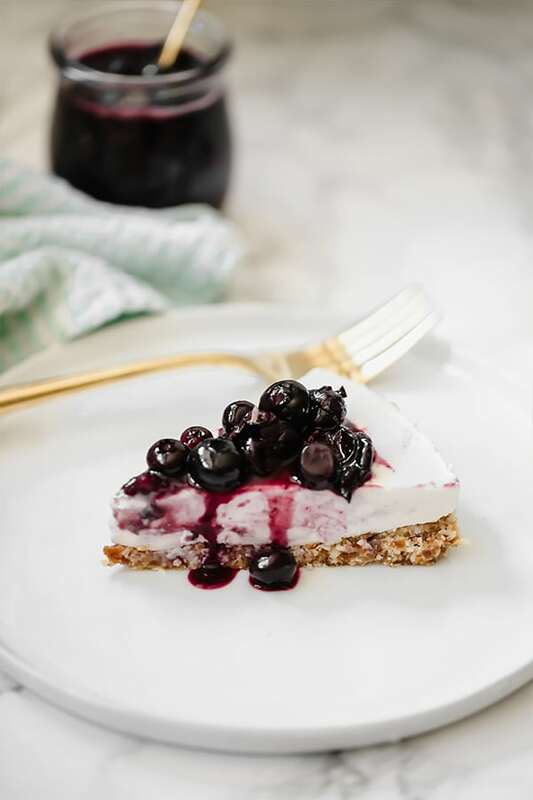 This cheesecake may be completely dairy free, but it still has all of the flavor, consistency, and nostalgia of a creamy New York style cheesecake! These are for the simple no-bake crust. This is filling for the cheesecake. Coconut cream can be purchased either by itself, or you can simply place a few cans of coconut milk in the fridge overnight and use the cream that hardens on top. Also referred to as coconut cream concentrate or coconut mana, this helps make the filling nice and creamy! This is the sweetener in the filling. Blueberries, dried lavender, and lemon. These fresh ingredients are perfect for spring! Technically, the sauce for the cheesecake is optional, but it really adds to the flavor. Vital proteins gelatin is what helps hold the cheesecake filling together. It’s made from grass-fed beef gelatin, and is completely flavorless! 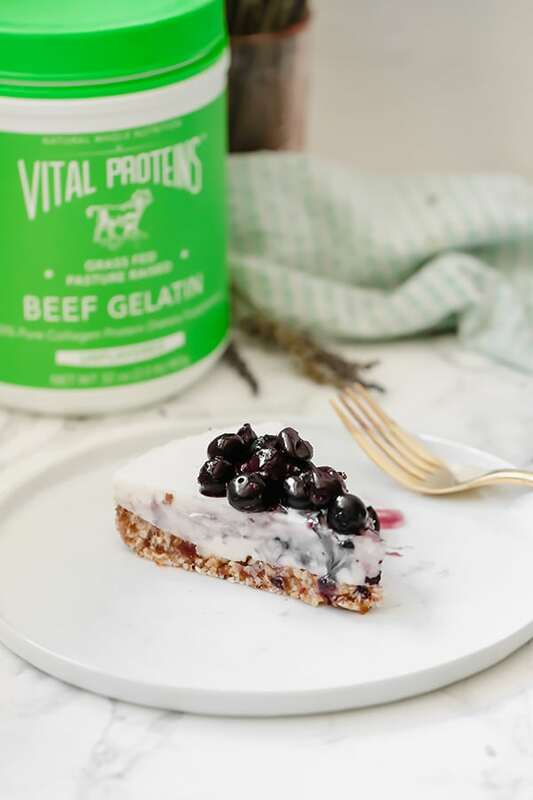 As an egg-free baker, I use Vital Proteins Gelatin in the vast majority of my baked goods and it’s an absolute lifesaver! Not only does it do an amazing job substituting for an egg, but it comes with a long list of health benefits on its own. Gelatin helps support the health of the joints, the elasticity of the skin, and the integrity of the gut lining. 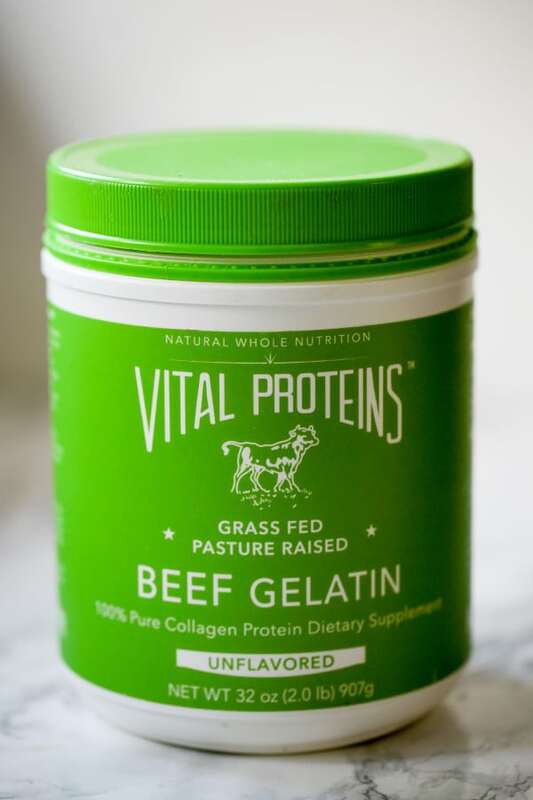 I’ve noticed such a difference in the ongoing health of my gut by using Vital Proteins collagen and gelatin! The springform pan is best for making an authentic, round cheesecake, but a square baking dish works just as well if you’d rather make bars! Line the base of a 7-8″ springform pan with parchment paper and set aside. See notes for alternatives. Using a food processor, blend the dates. Add the shredded coconut and coconut oil and blend until fully combined. Evenly the crust mixture into the pan and set aside. Clean out the food processor for the next step. Combine the coconut cream, coconut butter, oil, and maple syrup in the food processor for 10-15 seconds. Set aside. Pour the water into a small saucepan and evenly sprinkle the gelatin over the water. Allow to sit for 2-3 minute to bloom. Place on the stovetop set to low heat and melt the mixture for 1-2 minutes, not allowing the water to bubble. Use a whisk or milk frother to blend the gelatin mixture until frothy. Add the gelatin mixture into the food processor and mix for another 10-15 seconds. Carefully pour the filling over the crust and place in the refrigerator overnight. Add all of the ingredients (reserving the gelatin) to small saucepan and place on medium heat. Stir for 4-5 minutes, and don’t allow to boil. Once the blueberries soften, sprinkle in the gelatin and cook for 2-3 more minutes. Allow to slightly cool. Carefully remove the cheesecake from the pan by separating from the pan with a butter knife. Remove the springform and top with blueberry topping. Slice the cheesecake into 12 or more slices and enjoy! An 8×8″ square baking dish also works if you’d rather make cheesecake bars.